1. Finely chop onion and fry in oil in large frying pan over medium heat for 5 minutes, until soft. 2. Meanwhile, peel and grate ginger to yield 10g, crush garlic and measure out spices. 3. Cut chillies in half lengthways and run a teaspoon down the inside length, discard seeds and membranes, then finely chop the flesh. 4. Add ginger, garlic, spices and chilli to pan and season with salt and white pepper. Cook for 2 minutes on low heat, until spices are fragrant. 5. Cut tomatoes around the middle. Scoop out seeds using fingers and discard. Finely dice flesh. 6. Cut chicken into roughly 1.5cm chunks. 7. Add chicken, almonds and tomatoes to onions in frying pan and cook through. 8. Add coconut cream and peas, stir. Add coconut water (or just water) to pan to create sauce consistency to your liking. Place the lid on the pan and very gently heat through, stirring occasionally to ensure the sauce doesn’t catch. 9. Cook for 3 to 4 minutes, until chicken is tender and springy to the touch. 10. Make cauliflower rice (optional serving suggestion). Steamed rice can be used instead if preferred. 11. Stir Mundella Lactose Free Natural Yoghurt through the sauce and adjust seasoning with salt and white pepper if necessary to balance the flavour. 12. 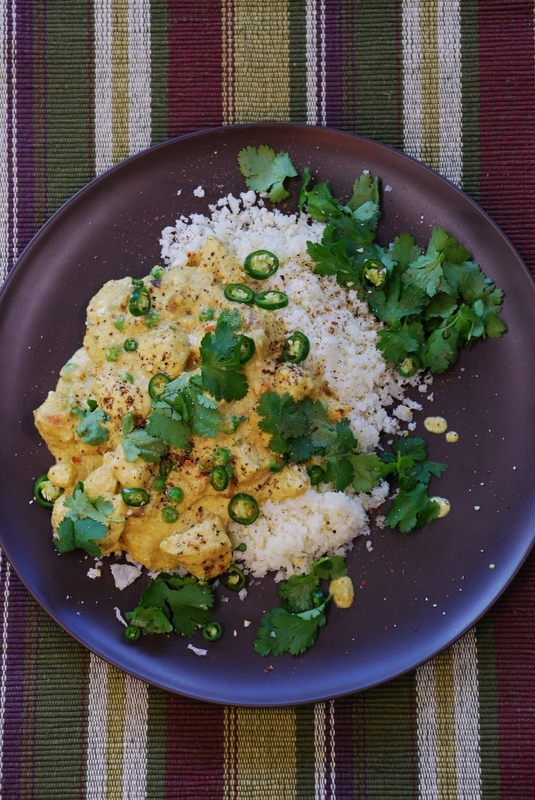 Top Korma with coriander leaves, scatter with a couple of pinches of ground cardamom and serve with cauliflower rice. This delicious recipe was supplied by Matters of Taste Cooking School. For more, visit https://mattersoftaste.com.au.